Best known for his exploits in Porsche Spyders, McAfee also drove other cars occasionally. 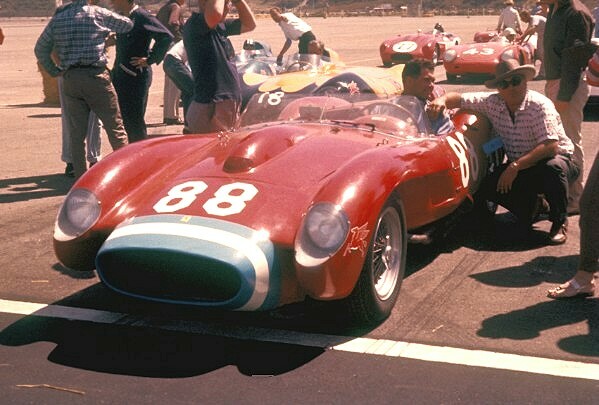 At Del Mar he drove this Ferrari, then owned by Stan Sugarman. This was the only time Sugarman entered the car in a race. I didn't know which Ferrari Testa Rossa this was, so I asked historian David Seielstad. "0754 was sold new to Stan Sugarman and raced just once at Del Mar: May 2-3, 1959. Jack McAfee and Mary McGee raced it that weekend. Sugarman decided he did not like it or something and sold it to George Keck in Seattle by June 1959. Keck raced it throughout 1959, then sold it to Jack Graham (usually #124). Graham crashed the car at Laguna Seca on October 22, 1960. In 1962 Graham sold the remains to Bob Gengami needing a full rebuild. Gengami raced it in 1962, then sold it to David Love in 1963. Love raced it in period and still owns it. He ran every Monterey Historic event from 1974-2009. Raced as #9."